Accidents involving chemicals and other hazardous materials (HAZMAT) require fast and accurate gas measurements as part of the first response. Accidents are by nature unexpected and unpredictable, so the equipment used for the first response in these situations should be flexible enough to work in a wide variety of different scenarios. CBRN Units that are tasked with protecting the public from chemical, biological, radiological and nuclear threats also need similar solutions for identifying and mitigating chemical threats. As it is not always possible to know beforehand what you may encounter in HAZMAT situations, there is need for both identification of gases and quantification of them. Traditionally analyzing an unknown sample has required sampling followed by time consuming and expensive laboratory analysis. However sometimes the situation requires quick decisions and there is no time to wait for results from a laboratory before taking action. 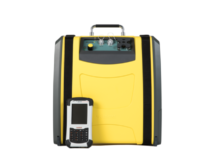 A portable analyzer that can give laboratory grade results can therefore be a crucial tool for first responders, helping them make informed decisions on the field. Gasmet portable FTIR analyzers are the ideal tool for this job. They offer the capability to measure a wide variety of gases and results can be viewed online. The technology also enables the identification of unknown gases in the sample, which is crucial in both HAZMAT and CBRN situations where it is impossible to know beforehand exactly what the responders may encounter.